It's that time of year again when we're all staring down a bowlful leftover Halloween candy and feeling some ambivalence. We certainly can't eat it all, right? 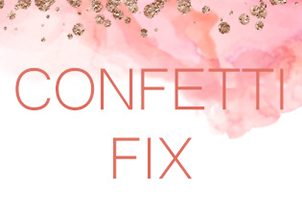 But tossing out perfectly good candy is not an option. This year I decided to put my leftovers to good use and make something that's truly share-worthy. 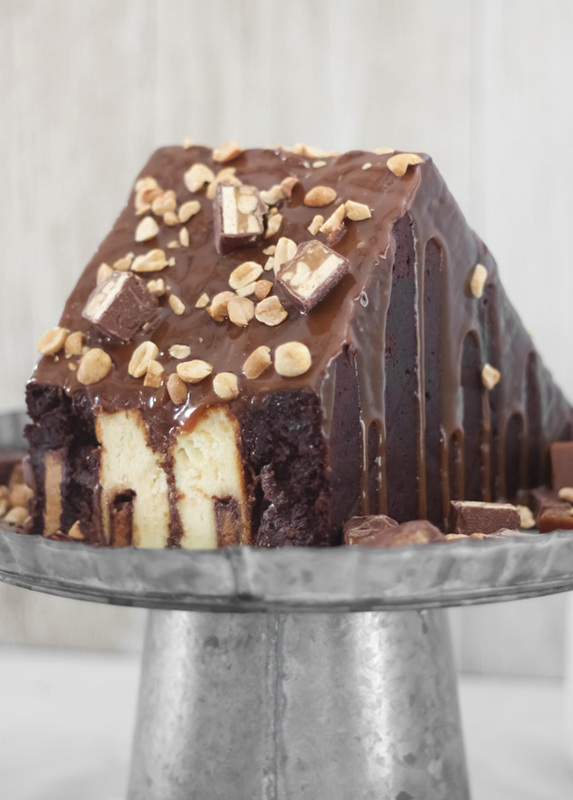 I present to you, Candy Bar Cheesecake Brownie Mountain. 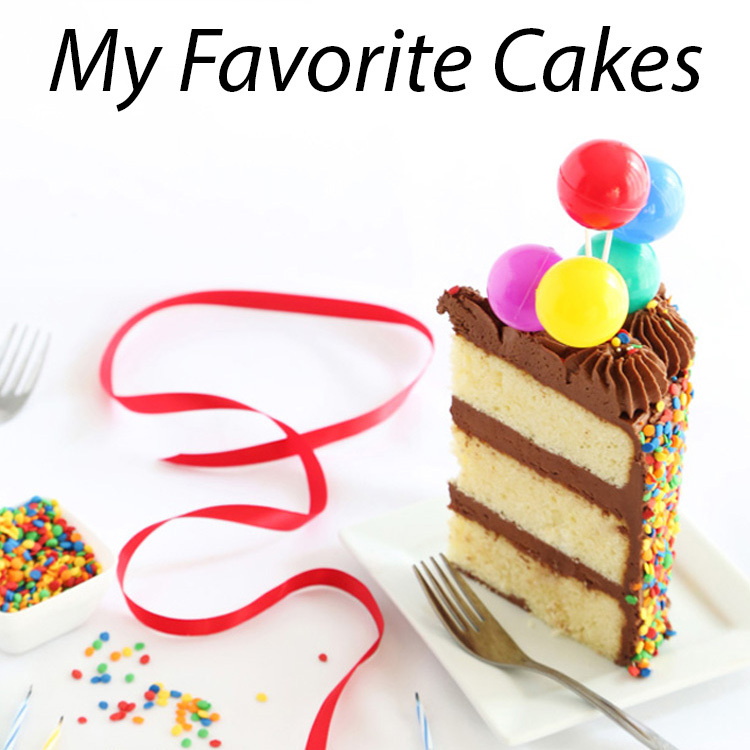 I often gush about new recipes, but I'm not exaggerating when I say this one is TOPS. It's so easy to make and crazy town delicious. The brownie and cheesecake both have mini chocolate bars baked inside. You can use just about any fun-size chocolate bar you have on hand. My brownie mountain contains a medley of Reese's Cups, Snickers, Milky Ways, Kit Kats and Rolo's (clearly, I have no self-restraint when it comes to these things... sorry not sorry). The entire dessert is finished with caramel sauce, roasted salted peanuts and more mini candy bars. Cutting this "Mountain" into pieces is half of the fun, because it's like a candy bar treasure hunt. Each slice is a little different. My first piece had half a Reese's cup and part of a Snickers bar, mmmm-mmm! I took plenty of step-by-step pictures to show you how to make your own. Like I said, it's easy - easier than you'd think! You'll need an 8x8-inch square pan to get started. First, make the brownie layer. After you mix up the brownie batter, spread half of it in a pan and top with your choice of mini candy bars (I used about 10). Top with the remaining batter and bake! Bake the cheesecake layer in the same pan, or in an identical pan to the one you used to bake the brownie layer. Mix up the cheesecake batter, pour it in the pan and press in about 10 mini candy bars. Bake! You'll notice I line the pans with parchment paper - this is a must. 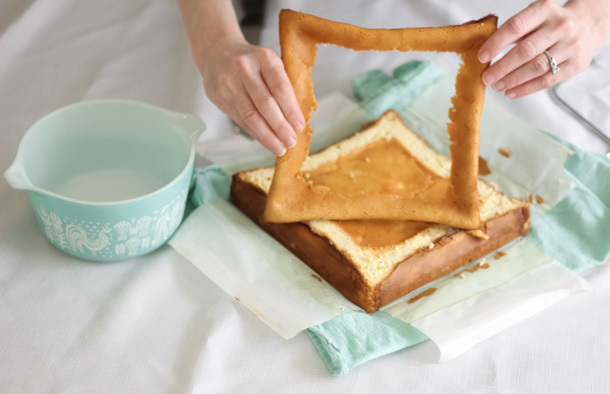 Make it so that the edges of the parchment overhang all four sides, then you can lift the brownie and cheesecake out of the pan easily. I removed the brownie layer from the pan when it cooled completely, but the cheesecake layer needs to cool in the pan and then in the refrigerator overnight to ensure that it removes in one flawless piece. I suggest chilling both layers overnight so that they cut easily and you can handle them without fear of them falling apart. I love this cheesecake recipe because it requires no water bath. But that means it'll puff up during baking and sink down when it's removed from the oven, leaving a puffy edge when it's completely cooled. Cut off the puffy edge to level the cheesecake before assembling. The amount removed isn't much, but it's enough to crumble over a bowl of ice cream! After you've leveled the cheesecake, cut it in half diagonally. 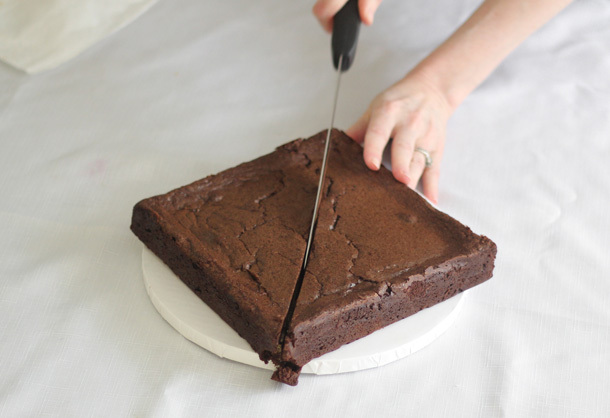 Cut the brownie layer in half diagonally. To begin assembly, place about 2 or 3 tablespoons chocolate-hazelnut spread on one piece of cheesecake and spread evenly. 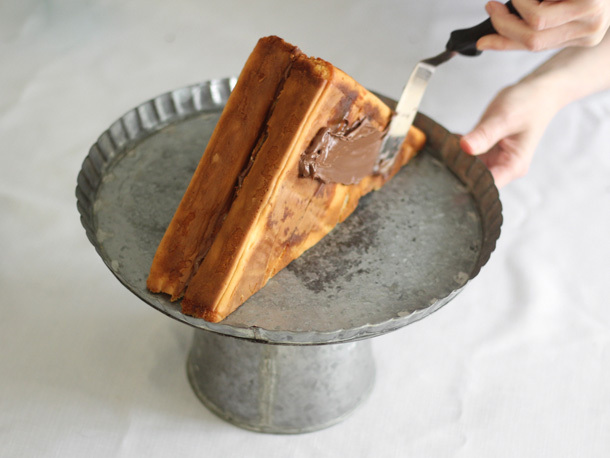 If you're not into Nutella, then you could use chocolate ganache or even cookie butter. Hold for a few seconds and then release. The two pieces should stand upright on their own. 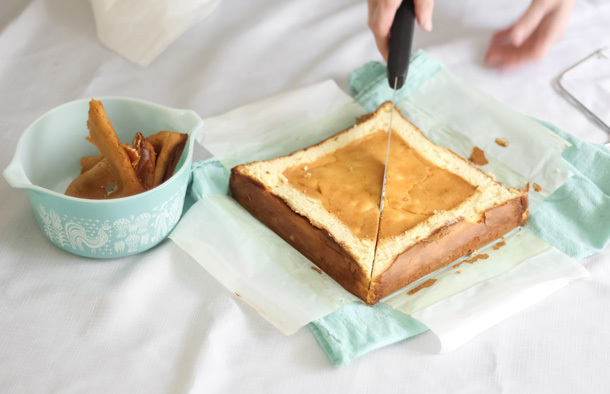 Transfer the cheesecake portion to a 10-inch serving plate (or cake stand) with an edge. Cover the sides of the cheesecake with the chocolate spread. Press a brownie layer on each side of the cheesecake layers. 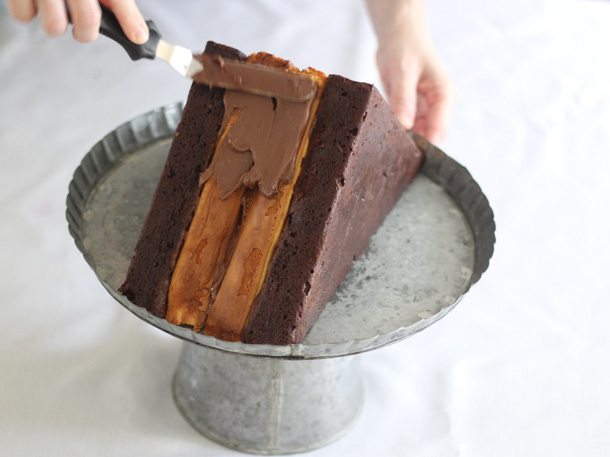 Cover the exposed cheesecake edges with Nutella; fill in any gaps between the layers. Leave the front and back unfrosted. Drizzle on the caramel sauce and top with everything but the kitchen sink! 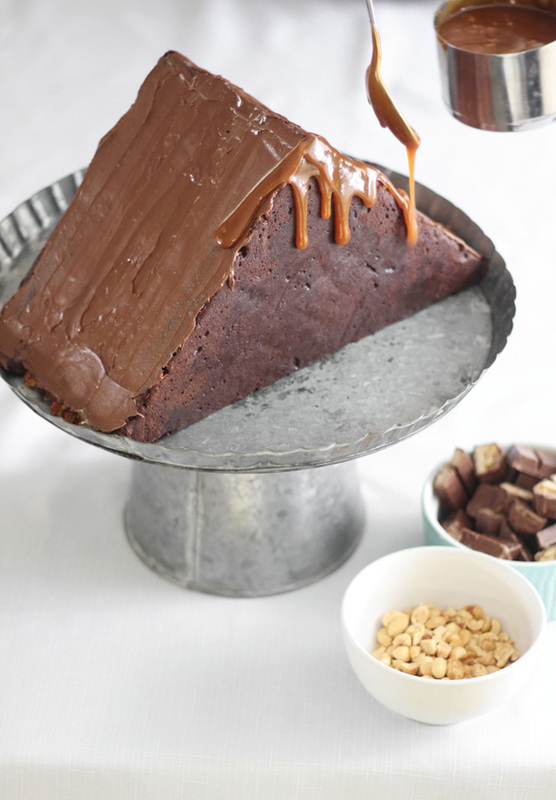 This Brownie Mountain requires some creative cutting as you travel toward the center. Cut vertical slices, and then divide them into manageable pieces before plating them. The first piece yields one very large piece, or two pieces divided at the middle. Trust me, it's not difficult to figure out once you get started, and it becomes more intuitive as you go. I found the best candies to use inside the layers are the softer sort, like Reese's cups, Milky Way bars and Rolo's. They make for neater slices. The Kit Kat wafers and peanut Snickers bars were a little more resistant to the knife and made slicing messy. I suggest placing those bars on top of the dessert, so that you can clearly see where to cut around them. I can't help but imagine this as a centerpiece on a holiday table. The shape reminds me of a Christmas tree, which gives me all kinds of ideas for new variations. I'm thinking gingerbread or peppermint would make a mighty fine mountain worth scaling! Start one day ahead. The brownie and cheesecake layers need to chill overnight before assembly. This recipe requires prepared caramel sauce. Avoid using the prepared caramel in squeeze bottles, as it's too thin. Go for the jars of thick caramel in the ice cream aisle - OR, if you have homemade salted caramel at the ready, then definitely use it! 10-12 fun-size candy bars (approximately 1 to 1.5 oz. each) Note! soft varieties like Reese's cups, Milky Way, Three Muskateer and Rolos work best. 10 fun-size candy bars (approximately 1 to 1.5 oz. each) Note! AGAIN, soft varieties like Reese's cups, Milky Way, Three Muskateer and Rolos work best. Assorted chocolate bars of all kinds, as much as you like; Snickers, KitKat, M&M's etc.- no rules! 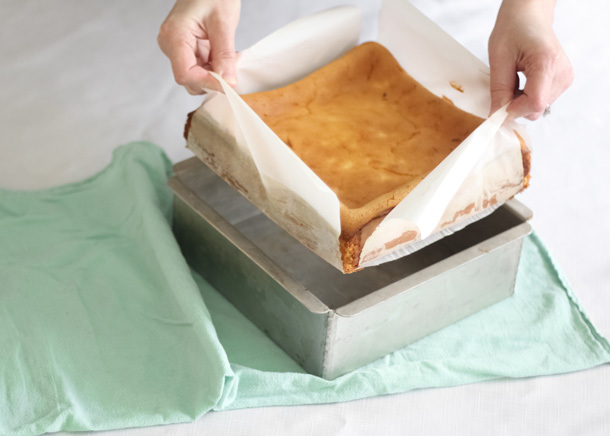 Make the brownie layer: Preheat oven to 300 degrees F. Grease an 8x8 square pan with vegetable shortening and line it with parchment so that the paper overhangs to edges. Grease the bottom portion of the parchment paper and place another sheet of parchment, crosswise, so that the paper overhangs the other two edges of the pan. In a mixer fitted with a whisk attachment, beat the eggs at high speed until lightened and fluffy, about 5 minutes. Add both sugars. Add the remaining ingredients and mix on medium speed to combine. Scrape down the bowl as needed. Pour half of the batter into the prepared pan and spread evenly. Press the candy bars, evenly spaced, into the brownie batter. Cover with the remaining brownie batter and smooth the top with an off-set spatula; bake for 45-50 minutes. 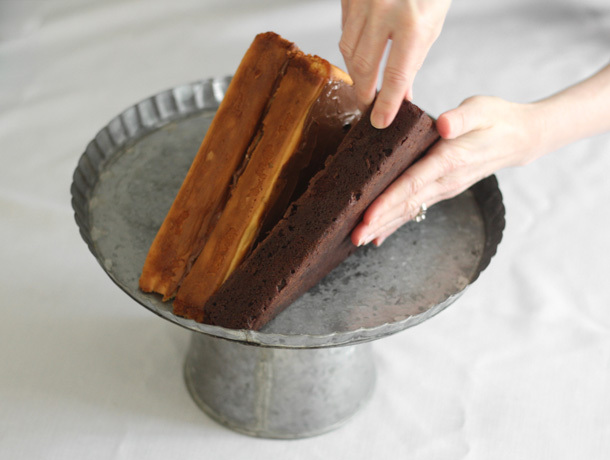 The brownie layer is done when a toothpick tester inserted in the center comes out clean. Remove from the oven and allow to cool completely. 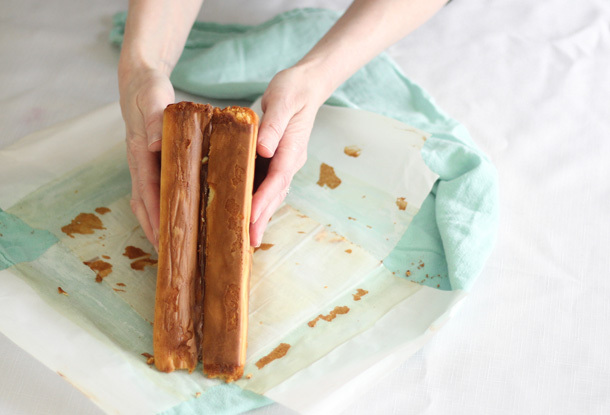 Remove the brownie by gently lifting it out by the four overhanging parchment corners. Transfer the brownie to a large plate and cover with plastic wrap. Refrigerate. Wash the pan and line as previously instructed with the brownie layer. Make the cheesecake layer: Preheat the oven to 325 degrees F.
Cream together the cream cheese and sugar until fluffy. Add the eggs, one at a time, beating well as they are added. Add the salt and vanilla extract. 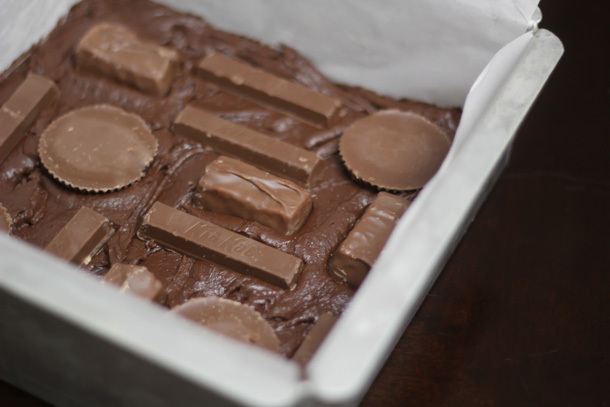 Pour the batter into the prepared pan and top with candy bars, evenly spaced. 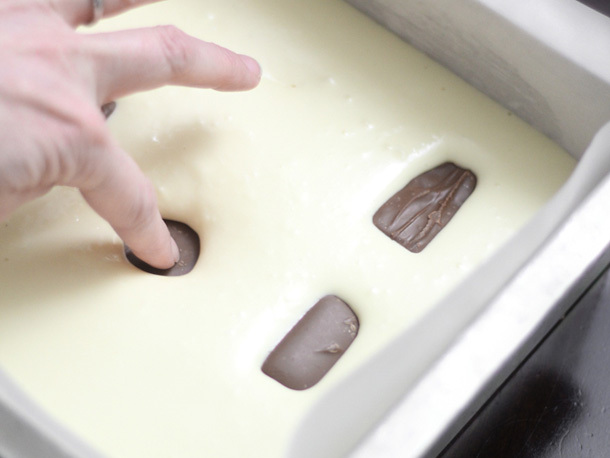 Using your index finger, press the candy bars down into the batter until they are completely submerged. Bake for 1 hour to 1 hour 20 minutes (check at 1 hour), or until the cheesecake is firm in the center and well-browned on top. Allow the cheesecake to cool completely in the pan. Cover the pan and transfer to the refrigerator. Allow both brownie layer and cheesecake layer to chill overnight. Assemble! Cut off the puffy edge to level the cheesecake before assembling. After you've leveled the cheesecake, cut it in half diagonally. 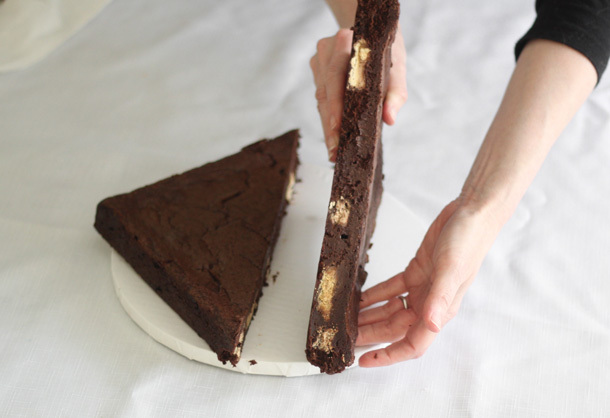 Cut the brownie layer in half diagonally. 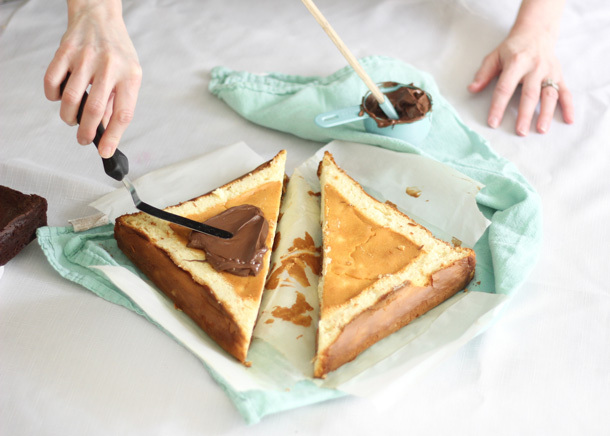 Place about 2 or 3 tablespoons chocolate-hazelnut spread on one triangular piece of cheesecake and spread evenly. If you're not into Nutella, then you could use chocolate ganache or even cookie butter. 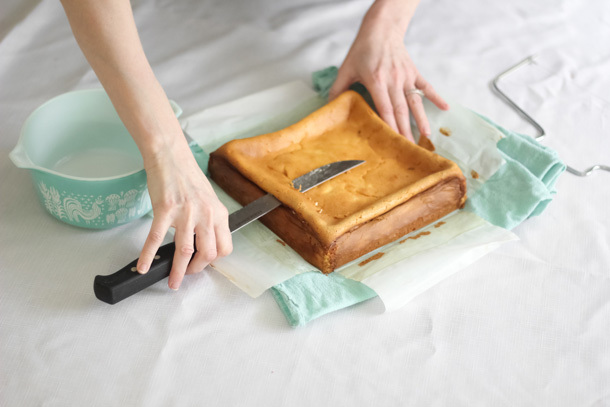 Press the two cheesecake pieces together and hold for a few seconds and then release. The two pieces should stand upright on their own. Transfer the cheesecake portion to a 10-inch serving plate (or cake stand) with an edge. Cover the sides of the cheesecake with the chocolate spread. 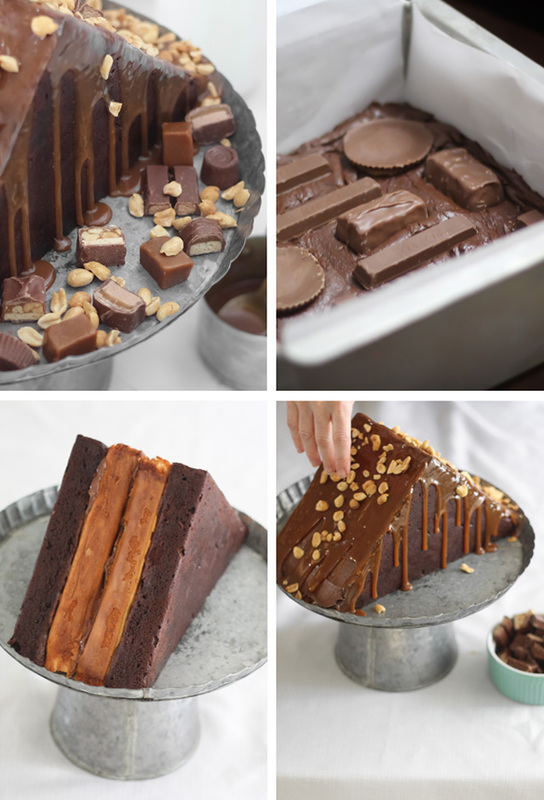 Press a brownie layer on either side of the cheesecake layers. 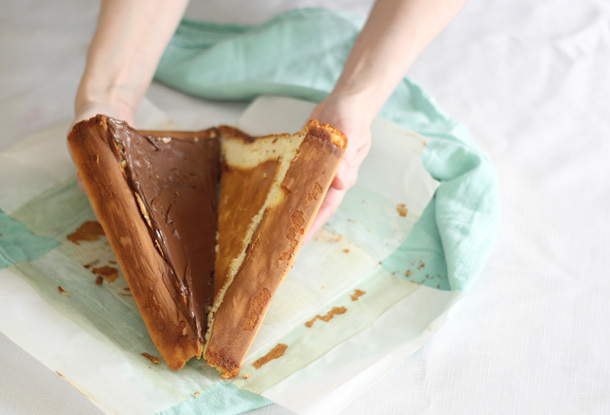 Cover the exposed cheesecake edges with Nutella; fill in any gaps between the layers. Leave the front and back unfrosted. Drizzle on the caramel sauce and top with nuts and chopped candy bars. To serve, cut the cheesecake in vertical slices and divide larger pieces into smaller servings before plating. Store leftovers in the refrigerator. So insane! But this is going to be the center piece of my Xmas table! 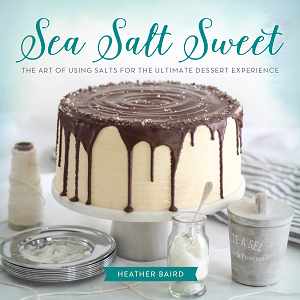 On the list for Thanksgiving dessert. To h*ll with the pumpkin pie!!!! What the WHAT?! 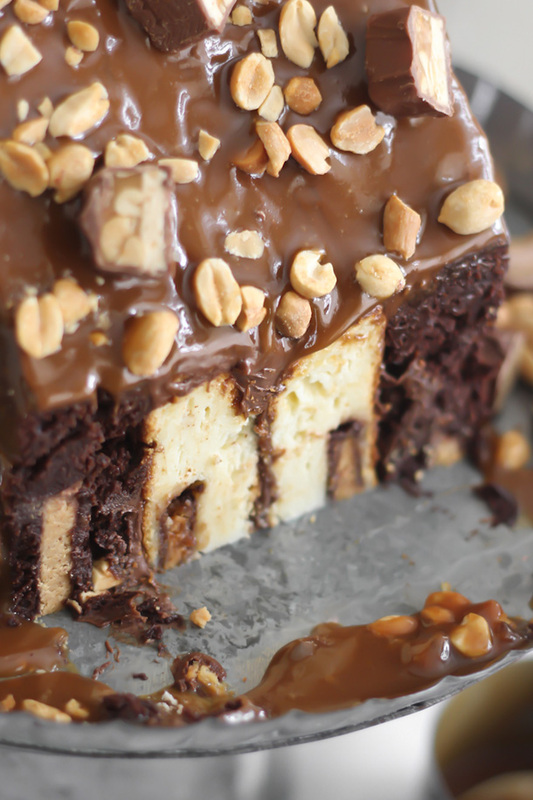 You just made a mountain of brownies and cheesecake and candy and caramel and nutella. Seriously, god bless your existence. Kinda dying right now. I'd climb the hell out of this mountain. 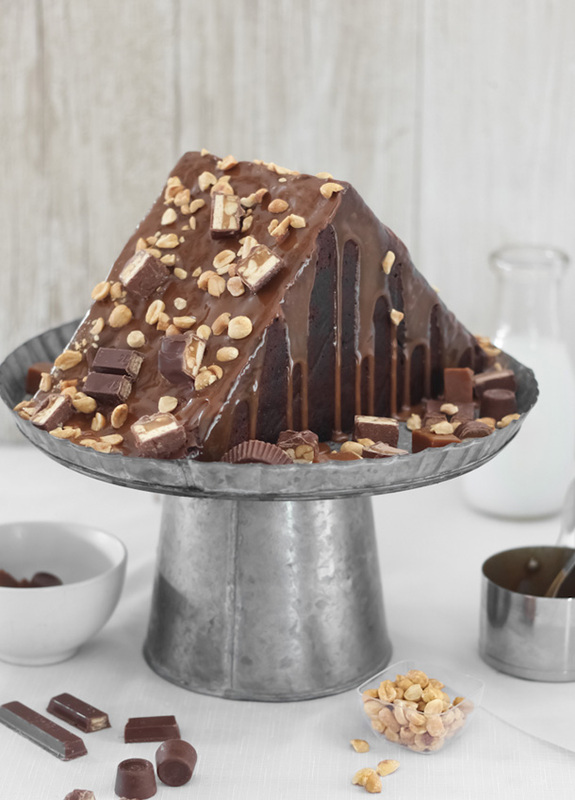 Hi Heather, this "mountain" looks so gorgeous an sooooo delish! I'm not going to try making a ginger bread house for Christmas this year, this treasure mountain is way easier and seemed a lot more delicious! Thank you for the recipe! This is my favorite use of Halloween candy I have seen thus far. Bravo! Lucky for me, my bday is coming up shortly and maybe I'll get to have this! 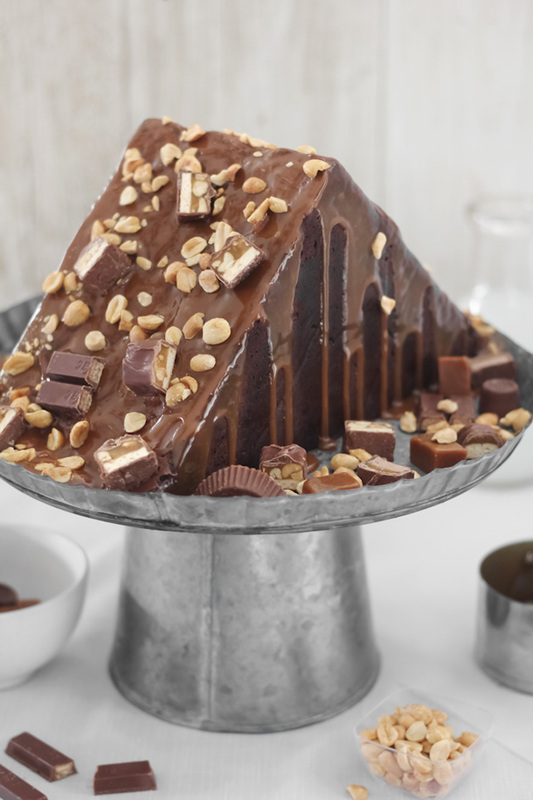 You use the words brownie mountain and I instantly wonder why this phrase has not played a greater role in my life until now. Oh my god, this is every fat girl's dream! Can't wait to make it! Seriously drooling right now. I need this like I need more weight on my tookas....which I don't...but I do at the same time! 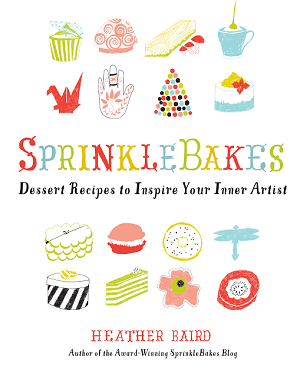 I need to find a special occasion to make this now...or not, I should make it just because tomorrow is Tuesday! I made this a few years ago for Thanksgiving. It was amazing! I am making it again this year. Hi Heather, the "click for printable version" is disabled. Any chance of getting it up and running? I've made this GENIUS creation twice and have, of course, loved it! Hi, thanks for letting me know! I'm not sure what happened, but it seems to be working now. Let me know if you still have trouble. 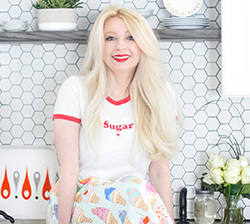 I'm so happy you love the recipe! Thank you for trying it.